I have a favorite saying about transportation: "If you plan cities for cars and traffic, you get cars and traffic. If you plan for people and places, you get people and places." It sounds obvious, but when I make this point to audiences around the country, it's a real eye-opener. They love it. PPS is showing the way forward, helping communities realize a different vision of what transportation can be. The power of this simple idea is that it reflects basic truths that are rarely acknowledged. One such truth is that more traffic and road capacity are not the inevitable result of growth. They are in fact the product of very deliberate choices that have been made (for us, not by us) to shape our communities around the private automobile. We as a society have the ability to make different choices--starting with the decision to design our streets as comfortable places for people. Thankfully, over the past ten years, a swelling number of people across North America have stood up and demanded something better. PPS is showing the way forward, helping communities realize a different vision of what transportation can be. Suppose, for instance, that downtown streets could become destinations worth visiting, not thruways to and from the workplace. Imagine transit stops and stations that make commuting by rail or bus a pleasure. Picture neighborhood streets where parents can feel safe letting their children play. 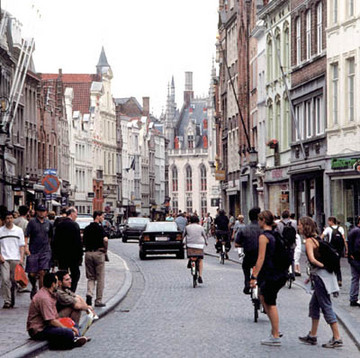 Streets can be places comfortably shared by transit, bicyclists, pedestrians, and cars, like this street in Brugge, Belgium. For years we've seen this philosophy gain traction in leading cities around the world. Barcelona has built boulevards and Ramblas that give pedestrians priority over the auto. Paris has developed a neighborhood traffic calming program to rival that of any city anywhere. London charges congestion fees for vehicles entering the city center, successfully reducing traffic levels and funding an aggressive program to improve transit. Bogotá now boasts a world-class bus rapid transit system and has established a mandate to eliminate private auto use during the morning rush hour by 2015. North American communities are discovering new solutions to the problems of transportation. Not so long ago, ideas like these were considered preposterous in most North American communities. "Public space" meant parks and little else. Transit stops were simply places to wait. Streets had been surrendered to traffic for so long that we hardly considered them to be public spaces at all. But now we are slowly getting away from this narrow perception of "transportation as conduit for cars" and beginning to think of "transportation as place." PPS sees signs of this everywhere we go. North American communities are discovering new solutions to the problems of transportation, each in their own way. In Tucson, Arizona, it means revitalizing downtown by creating a network of walkable streets and alleys that connect major public destinations. In New Jersey, it means helping towns solve transportation problems by kicking the habit of sprawl-inducing land use. In New Hampshire's North Country, it means preserving the small town sense of place by calming traffic and reviving public spaces that have been overwhelmed by car-centric development. 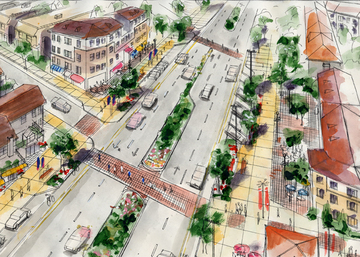 PPS is helping California's San Mateo County relieve gridlock and increase transit ridership by transforming auto-dominated downtown streets into pedestrian-friendly public spaces. These projects say to me that we can redesign our transportation networks to reflect their true importance as public space. We are poised to create a future where the greatest priority is given to pedestrians, bicyclists, and transit. To be sure, cars will have their place, but the newfound ease of walking and "alternative transportation modes" will make driving less prevalent in most towns and cities. As a result, we will see significantly more people on the streets, which will turn into public forums where neighbors and friends can connect with each other. The street itself will fulfill the critical "town square" function that is missing in most communities today. That may sound like a far cry from where we stand now, but at PPS, we are helping these ideas take root today. From suburban New Jersey to the high-tech corridor of California's San Mateo County, communities large and small all over the U.S. have stepped forward to say the old way of doing things isn't acceptable any more. The stories in this newsletter chronicle the first wave of a revolution in how we approach transportation and public space. I encourage you to read on and feel inspired, as I do, by the knowledge that the best is yet to come.